There are a few good spring vegetables to be found in this region now that April is coming to a close. Asparagus have sprouted, and the wild things like ramps and fiddlehead ferns have made their annual appearance (and I had my first annual sighting of Wildman Steve Brill leading a foraging tour in Prospect Park a couple weeks ago). 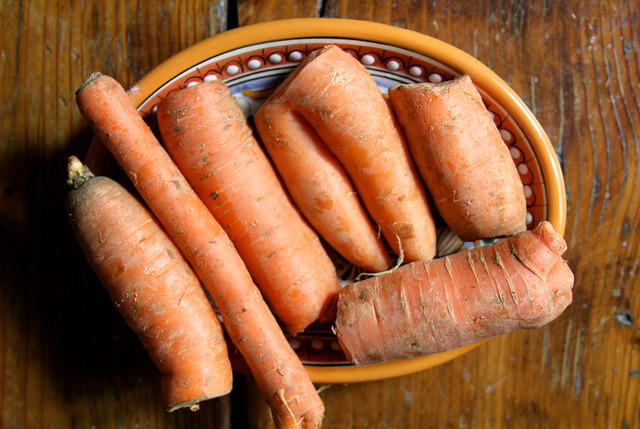 But good carrots are still to be found, having been locked up in winter storage while their sugars concentrate and flavors deepen (much like coarse, over-wintered spinach). The months have endowed these carrots with a dusky surface but vibrant orange flesh thick with fibers. Let’s enjoy them as they are—gently cooked and slightly perfumed with something that equally took months to ripen to its full flavor potential: preserved lemons. I brought these carrots to an Easter party and lo and behold, they were the only vegetable on the table. So I can’t take much credit for them all being eaten up (maybe the mischievous Easter bunny helped out?). But they were a colorful contribution to the deviled eggs, ham, lamb and more egg dishes that showed up. I think they can be an easy side dish to make one night and save for many leftovers throughout the week. 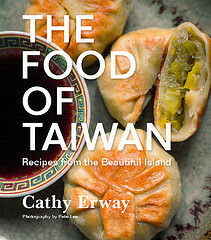 It can be served warm, hot or cold, immediately or not, and you can futz and omit and add with the spices used. Carrot salads are a staple of Moroccan homecooking, and that region is where this dish takes its inspiration. 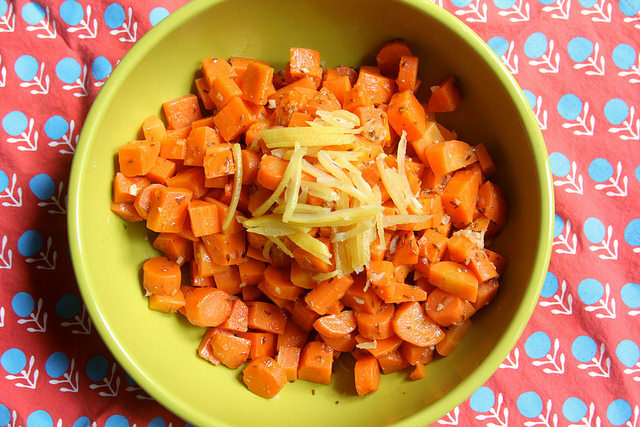 When I gave a jar of my own (under-fermented, in hindsight) preserved lemons to a part-Moroccan family I was visiting one night for dinner, they were preparing a carrot salad pretty similar to this. 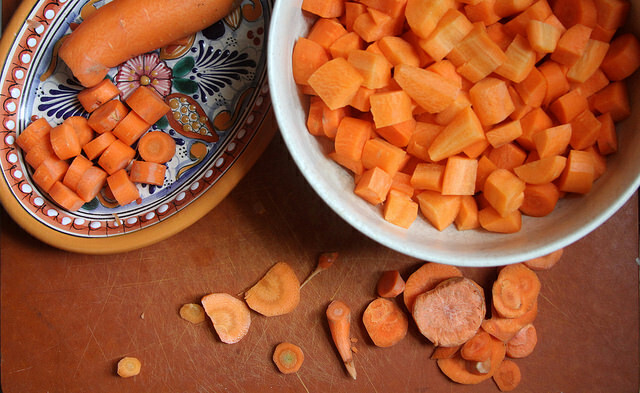 And I found two somewhat similar carrot salad recipes in the Moroccan section of Claudia Roden’s cookbook, Arabesque. No need to worry about having a full spice cabinet. I chose just one dry spice for these hardy, tasty carrots: cumin. If you have whole cumin seeds, toast them up in a dry pan for a few seconds until wonderfully fragrant, before breaking open a bit with a mortar and pestle (or back of a spoon against a small bowl). It brings out the most from the least bit of ingredients, and I think it’s a fun task to get you (and your kitchen) in the right, spicy mood. 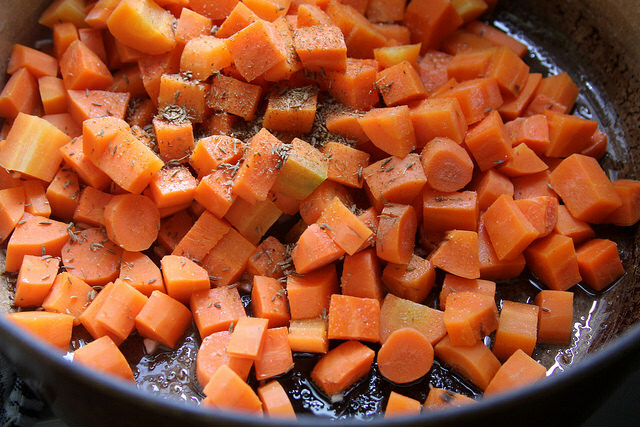 After a quick boil, chopped carrots are briefly sauteed with the cracked cumin, minced garlic and olive oil. After it cools a while, stir in the preserved lemon peel (you can get it in ethnic or big grocery stores like NYC’s Kalustyan’s if not preserving your own), only the yellowest parts, slivered. That’s basically it—except for a little garnish of fresh herbs. Mint seemed a fitting touch, to signal a changing of the gardens to spring. Bring a pot of salted water to a boil. Add the carrots and cook for 3-4 minutes, until the pieces are still firm but crisp-tender. Drain. Although it can’t suffice as a full meal, this all plant-based side is a great way to get your oranges. That means Vitamin A galore, along with fiber, potassium, Vitamin C, Vitamin K and much more. 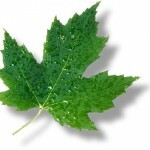 Seven maple leaves: Mostly carrots, stuck in cold storage over the winter and looking ragged at the farmers market. This is a great way to use up slightly old, less snackable-looking carrots in your crisper drawer. 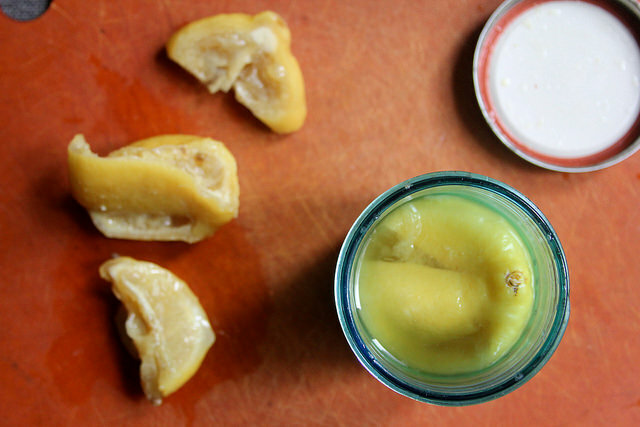 Extra points if you make your own preserved lemons from scratch, although in this Northeast region, all lemons will be shipped in from afar. Love this! Always full of wonderful ideas! 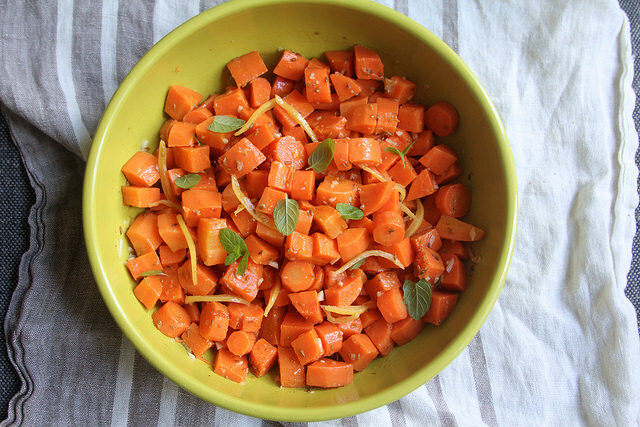 I really like carrot, this salad is so great for me! Thank you for sharing the recipe! Hey friends just click and connect with this amazing online helper which give you fully instruction about the window 10. Thanks for this amazing recipe dear,.